How Do They Work? Heat Sink! – Biovolt's Offical Tech Blog. A heat sink is a device that incorporates either a fan or some other means to keep a hot component, such as a processor , cool. There are two heat sink types: active and passive. The picture to the right is an example of a heat sink that has both active and passive cooling mechanisms. Active heat sinks utilize the computer’s power supply and most typically, fans Sometimes these types of heat sinks are referred to as an HSF, which is short for heat sink and fan. There are also liquid cooling systems, which have become more popular in recent years. Tip: If you are looking to purchase a fan heat sink, we recommend those with ball bearing motors as they often last much longer than sleeve bearings. Passive heat sinks are those that have no mechanical components. Consequently, they are 100% reliable. Passive heat sinks are made of an aluminum finned radiator that dissipates heat through convection. For passive heat sinks to work to their full capacity, there should be a steady airflow moving across the fins. heat transferring capacity of the heat sink will also increase. The thermal conductivity of the aluminum is 235 W/mK; it is the cheapest and lightweight metal. Aluminum heat sinks are also called as extruded heat sinks as they can be made using extrusion. These are made of metals that are stamped to form a particular shape. This stamp creates the heat sinks whenever metal is moved through the stamping machine. These are cheaper compared to extruded heat sinks. These are used for low-power applications and hence these are low in performance. These are manufactured by machining process; frequently gang saw is used for removing a block of material to make inter fins with precise spacing. These are expensive as a lot of metal may go as wastage in the manufacturing process. These folded-fin heat sinks have large surface area,and possess folded heat sink material, and hence, they have very-high performance and very-high heat-flux density. In these sinks,air is directed to flow directly into heat sinks through some kind of duct. This makes the whole thing expensive as the cost of manufacturing and ducting is included in the overall cost of the sink. A heat sink is a passive heat exchanger, and it is designed to have large surface area in contact with the surrounding (cooling) medium like air. The components or electronic parts or devices which are insufficient to moderate their temperature, require heat sinks for cooling. Heat generated by every element or component of electric circuit must be dissipated for improving its reliability and preventing the premature failure of the component. It maintains thermal stability in limits for every electrical and electronic component of any circuit or electronics parts of any system. The performance of the heat sink depends on the factors like the choice of a material, protrusion design, surface treatment and air velocity. 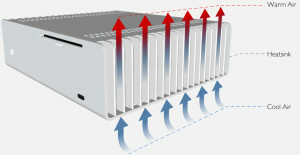 The central processing units and graphic processors of a computer are also cooled by using the heat sinks. Heat sinks are also called as Heat spreaders, which are frequently used as covers on a computer’s memory to dissipate its heat. If heat sinks are not provided for electronic circuits,then there will be a chance of failure of components such as transistors, voltage regulators, ICs, LEDs and power transistors. Heat sinks not only provide heat dissipation, but also used for thermal energy management done by dissipating heat when heat is more. In case of low temperatures, heat sinks are intended to provide heat by releasing thermal energy for proper operation of the circuit. Heat spreaders are another type of passive heat sink that are used to help dissipate the heat produced by RAM Modules. What devices in a computer use a heat sink? The components that generate the most heat in your computer are the CPU Video Card and Power Supply They always have some cooling, usually a fan. Other components that may have a heat sink include the North Bridge and South Bridge And Memory Although it is also not uncommon to find heat sinks on other expansion cards and hard drives. Previous Previous post: What is Net Neutrality? Does the FCC regulate the Internet?? Next Next post: How Do They Work? Virtual Machines!